I have a naked wall! At Christmas, my husband made a fireplace for me. In addition to giving me another opportunity for decorating (and hanging the stockings I may eventually finish), I now a big space over a fireplace mantel, perfect for displaying seasonal quilts. 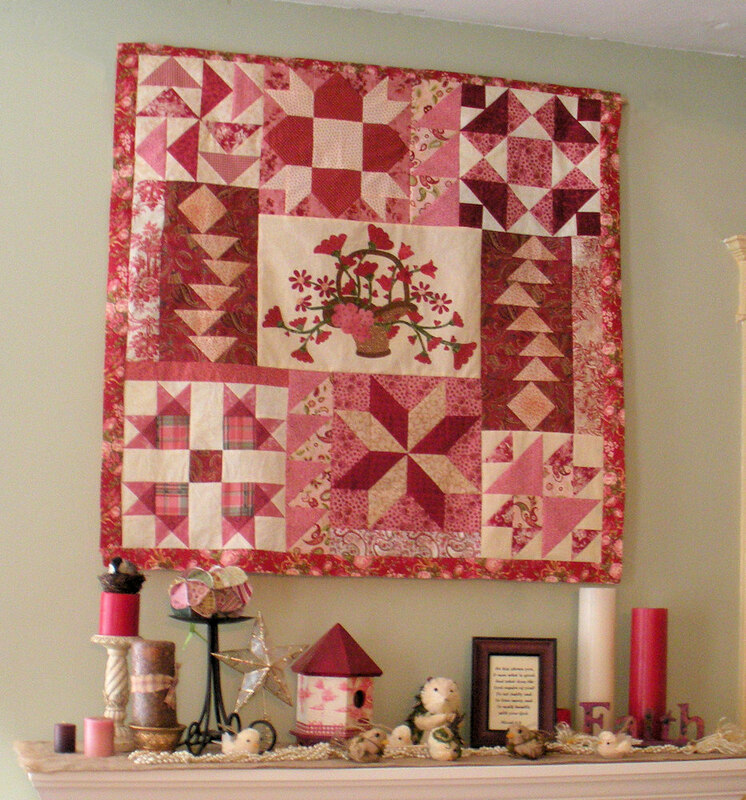 I’ve always rotated seasonal quilts throughout the house, but with this new wall, I need to make some more! I want an Americana quilt that uses softer, more rustic reds, whites/beiges, and blues. Not primaries, not cutesy, not primitive. I will probably piece it instead of doing as much applique as I did for the last two quilts. I made this one for Christmas. I used a sort of vintage/folksy/rustic/elegant theme for Christmas last year, but I wanted a quilt that would be versatile enough to accommodate different styles of Christmas decor. I left the Christmas quilt up until I finished the Valentines Day quilt. This quilt was a little more challenging because I knew it would probably stay up longer – I didn’t want it to be too specifically Valentine-y. But here it is, after Memorial Day, after Flag Day, and getting close to Independence Day! So I took it down today, and that wall looks embarrassed without any clothes quilts on. If I wait much longer, I could just segue into autumn, right? 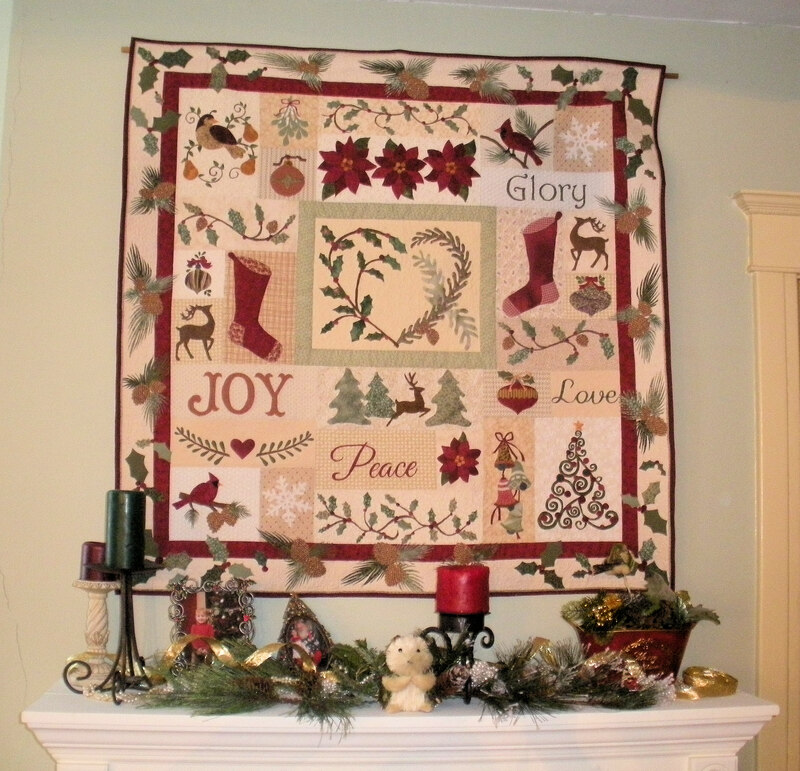 Do you have seasonal quilts? How often do you change them? Where do you display them? Author CathePosted on June 25, 2015 October 7, 2015 Categories Contemplating, WorkingTags Americana, Christmas, Christmas decor, fireplace mantel, Quilt, quilts, Seasonal Quilts, Valentines Day3 Comments on I have a naked wall! 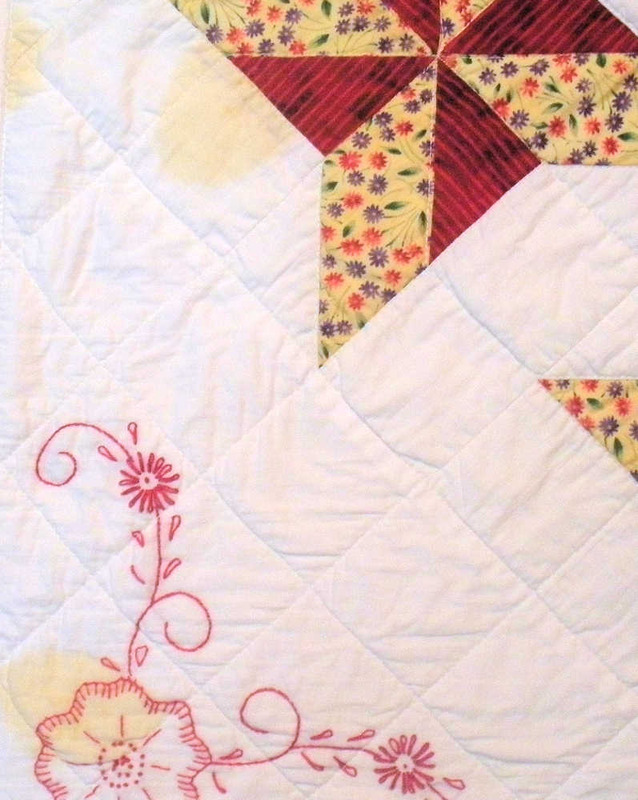 I made this 25″ X 25″ quilt about twelve years ago and used it as a table topper in our bedroom for about three years. It wasn’t a table that was used for anything; nothing was spilled on it. When we moved, I did not have a use for a quilt of this color and size, so I put it the linen closet. It was not sealed away in plastic or stored where it might get dirty. I am not careless of my quilts. The batting is white cotton. It doesn’t have seeds. When I washed it several times, to FINALLY get rid of the bleeding from that red fabric, it was rinsed thoroughly and dried flat. And yet, it’s stained. The yellow is obvious. After raising three sons, I have an arsenal of stain-removal techniques, and none of them worked. I used oxi-clean. Borax. Fels Naptha. Handmade soap. Everything. The last couple times, I went ahead and dried it in the dryer. I give up. 1. Should I cut it up and try to do something with the salvageable pieces? It’s not very big, and the elements are not close together, so I am not sure what I could do with it. 2. Should I try to tea-dye it? Redwork embroidery is generally only used on white fabrics, but the splotchy-ness of that style might partially camouflage the stains. 3. Should I toss it out and stop wasting my time? I could let it go and move on. What do you think? I’m not going to use it as it is now, and there’s no point in putting it back into storage. I have nothing left to lose, right? I was chatting with my friend Beth from One of His Branches , and we were wondering if many people are doing their Christmas shopping yet. I like doing my shopping early, but there are always some gifts that don’t get purchased until the last minute – usually because I can’t decide what to buy. Like so many people, I do a lot of my shopping online. I have one daughter-in-law who is very artsy, and I can find pretty things for her on etsy. The grandchildren’s presents come mostly from Amazon. I usually make things for the other women on my list. Everyone loves handmade gifts! It’s always nice if people have collections or hobbies – that makes them easy to shop for! My brother-in-law is a John Deere farmer. We used to buy him John Deere stuff, when we were still exchanging gifts for the guys. One year we gave him a light-up John Deere Christmas Tree Topper. Now I exchange gifts with my sisters and the guys get together for a male bonding day at the shooting range. They are a lot more enthusiastic about Christmas gifts than they used to be. 1. No gift cards, unless it is for something very specific. Last year we gave my oldest son and his wife a gift card for a bed and breakfast. They love to get away for short trips. Do you shop early for Christmas?